The population genetic perspective of our P. pacificus work focuses on La Réunion Island in the Indian Ocean. In surveys since 2008, we found La Réunion to harbor an exceptional diversity of P. pacificus that covers all known haplotype groups of the species (Herrmann et al., 2010; Morgan et al., 2012). With its high number of endemic scarab beetles, its young geological age of only 2-3 million years and the fact that it represents a French oversea Department with an outstanding infrastructure, La Réunion Island represents an exceptional system for detailed investigations of population genetics and evolutionary ecology. Since 2010, we run a small field station on the Island and the Max-Planck Society provides funds to support our Island activities. So far, we obtained more than 500 P. pacificus isolates from La Réunion from a diversity of beetles, locations and habitats. We are currently analyzing these strains, using high throughput methodology. Together, La Réunion presents a unique research opportunity to couple population genetics and ecology with genetic and genomic studies. 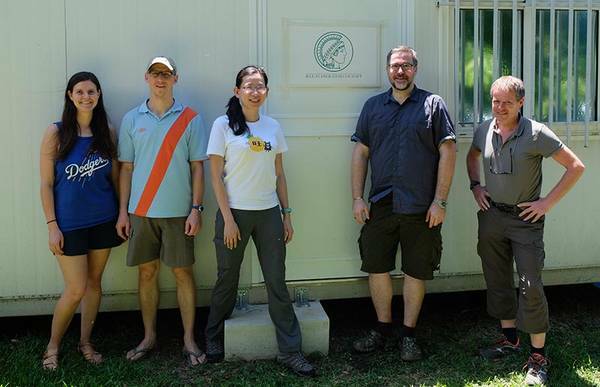 Since 2010 we run a field station on La Réunion, first in the city of Le Port and since 2017 on the campus of the CIRAD in St. Philippe. McGaughran, A., Morgan K. & Sommer, R. J. (2014): Post hoc association analyses in a hermaphroditic nematode support significant genotype-environmental interactions. PLOS ONE, 9: e87317. doi:10.1371/journal.pone.0087317. Morgan, K., McGaughran, A., Ganeshan, S., Herrmann, M., & Sommer, R. J. (2014): Landscape and oceanic barriers shape dispersal and population structure in the Island nematode Pristionchus pacificus. Biol. Journal Linnean Soc., 12, 1-15. Morgan, K., McGaughran, A., Witte, H., Bartelmes, G., Villate, L., Herrmann, M., Rochat, J. & Sommer, R. J. (2012): Multi-locus analysis of Pristionchus pacificus on La Réunion Island reveals an evolutionary history shaped by multiple introductions, constrained dispersal events, and rare out-crossing. Mol Ecol., 21 (2), 250-266. Herrrmann, M., Kienle, S., Rochat, J., Mayer, W., & Sommer, R. J. (2010): Haplotype diversity of the nematode Pristionchus pacificus on Réunion in the Indian Ocean suggests multiple independent invasions. Biol. J. Linn. Soc., 100, 170-179.